Aristotle already knew that happiness depends upon ourselves. But way too often we search for it in others, in the outside world, in short-term distractions. But we also hold the power to be truly satisfied. It’s in the way we think, the way we choose to spend our days, and who we choose to spend them with. 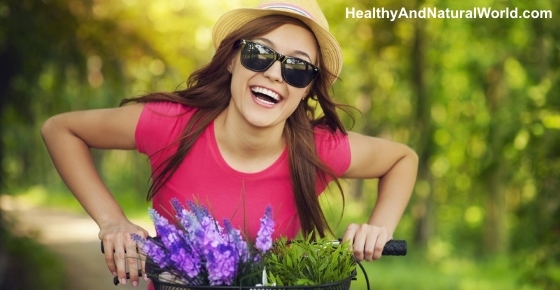 Here are 18 simple steps you can take to increase your inner happiness in a natural way and boost your mood naturally. Physical and psychological well-being are closely connected. When your body feels good, so does your mind. When you exercise, your brain releases endorphins – the happy hormones. Experts recommend at least 30 minutes of vigorous exercise per day – to fit better into your daily routine, this can be divided into three 10-minute blocks. Further reading: 10 Minute Workout to Completely Transform Your Body in 4 Weeks. It has been shown that acupuncture can help with depression, anxiety and stress, and is also becoming increasingly popular and recognized in the treatment of many other physical and mental ailments that may disturb your inner bliss. Further reading: 14 Effective Natural Remedies for Stress and Anxiety. When we meditate, our brain switches to a more relaxed mode. Parasympathetic nervous system gets activated – this is a part of the brain that is responsible for ‘rest-and-digest’ activities, and is the opposite of our usual stressed mode. Invest some time and learn a technique that will work for you. Be disciplined in your regular meditation practice. Meditation is an excellent way to relieve stress and improve your health while giving yourself a sense of control and well-being. Meditation is one of the 70 habits featured in my e-book 70 Powerful Habits For A Great Health which will guide you how to take positive steps to improve your wellness and overall health. Having a lovely massage can be very satisfying and uplifting. Our minds and bodies enjoy being touched. The experience can change the brain-wave activity and make you more relaxed. Add essential oils to the massage blend and inhale them to reach new levels of calmness. Ask a loved one for a 20 minute massage, doctor’s orders. Further reading: If you are interested to learn more about essential oils you can find useful information in my e-book Magical Aromatherapy that will help you to discover the power of essential oils and the most effective ways to use them. It often helps to look at your thinking patterns. Do you always interpret things in a negative way? Do you feel worried about the present and future? Remember, you chose those patterns, so you can also choose a better and more satisfying way of thinking. Sometimes it can be helpful to get some guidance from an expert. Cognitive-behavioral therapy is just one option. Find somebody you feel comfortable working with, and then dive in! You can’t force yourself to feel grateful, but when you genuinely feel it, your life becomes a much better place. Looking at the bright side of life and feeling grateful for little things, always gives your mood that little extra kick. Some people need more sleep and some people need less, but 8 hours is the gold standard. When we’re rested, everything feels better. Research shows that there is a connection between depression prevention and a good night’s sleep, and I’ve also mentioned it in my previous article about the 23 dangers of sleep deprivation. So create an environment in which you can sleep well – look at the temperature, light and levels of noise in your bedroom. Further reading: The Best Foods and Herbs for Better Sleep. Spending some time in the sun, or taking a walk in the forest, can make you feel better. Our bodies need sunlight to generate vitamin D, which is important for bone health. New research also shows that sufficient amounts of vitamin D reduce the chances of developing depression. So make sure to take advantage of every sunny day, especially if you live in a less weather-friendly place. Further reading: 13 Common Diseases Caused by Vitamin D Deficiency. Having a pet is a big responsibility, but it’s also a tremendous joy. Having an animal in your life brings you closer to innocence and pure love. Is there anyone that will love you as unconditionally as your dog does? Fake it until you make it. Research shows that if we force ourselves to smile, after a while, we do start feeling better. And it’s so nice to give somebody a smile, or to receive one! We should make enough time to do the things that energize us and make us feel alive. There is a phenomenon called ‘the flow’, which describes the state when we feel completely absorbed in an activity. The experience of flow is connected with improved mental health. It’s very important to feel close to people and connect with them. It is the deep human connections that really make the difference in our lives. So make time for people that are important to you, meet new people, give and receive. There are only 24 hours in each day, so be realistic of what you can achieve. We often try to fit too many things in, and then feel stressed and frustrated when we can’t do it all. Avoid that by planning and prioritizing in a you-friendly way. According to research that was published in Psychology and Education: An Interdisciplinary Journal, people who listen to music tend to be happier, calmer and more relaxed. So explore your music collection and put on what makes you boogie. Have you ever noticed how much better you feel after you’ve cleaned your room or flat? Dusting and getting rid of junk can be very therapeutic. It also creates space for new things to enter your life. According to Dr. Elaine Aron, sometimes just the illusion of order is enough, so reshuffling a few papers and making them look neater can do the trick. Detox. When our body is clean, the mind follows as well, and we become lighter, healthier and with improved mental energy. Give your body a break from processed foods, meat, alcohol, caffeine and nicotine. Watch the toxins leave your body and feel happy! Further reading: My e-book The Detox Guide will teach you how to cleanse and energize your body naturally and safely. For example lavender is used in aromatherapy and teas to enhance relaxation, valerian is often taken as a sleep aid and sometimes used for anxiety, chamomile is an ancient remedy for relaxation and for relieving stress, and St. John Wort is a perennial herb that has a long history of use for anxiety, depression and sleep disorders. Further reading: My e-book the Herbal Remedies Guide will teach you how to treat common ailments using herbs. More and more evidence is suggesting that what you eat affects how you feel. Your diet can alter your metabolism and brain chemistry, ultimately affecting your energy level and mood. Later on, I will point out the specific food groups that are proven to boost mood and help to reduce the likeliness of developing depression. To maintain that inner balance, you need to eat a balanced diet – full of nutrients that your body and soul need. Make sure that you consume enough whole grains, fruits, vegetables, healthy fats and proteins. Omega 3 fatty acids are full of health benefits, such as improving concentration levels and helping you to maintain a healthy state of mind. Scientists have reported than a body deficient in omega 3 is linked to depression. Don’t worry, you don’t have to scoff a giant fish every day to make sure you are getting enough omega 3, you only need to consume a small amount daily to reap the benefits. Food rich in Omega 3: Oily fish such as: salmon, herring, mackerel and halibut. Another sources are flax seeds, nuts, walnuts and dark leafy greens. Further reading: Proven Health Benefits of Omega 3 fatty Acids. Vitamin C is more than just a cold-buster. It is also effective in helping with depression. Like carbohydrates, vitamin C boosts the production of serotonin, also known as the happy hormone. Food rich in Vitamin C: Kiwifruits, oranges, strawberries, red pepper, guavas, sweet potatoes, spinach, grapefruits and peas. Vitamin E is great for keeping your skin healthy, due to it’s high levels of antioxidants, but is also a fantastic mood booster. In fact, low levels of vitamin E in the body have been associated with anxiety and depression. So if you’ve been feeling down lately, then why not increase your intake of Vitamin E. Who doesn’t want great skin and a good mood? Food rich in Vitamin E: Green leafy vegetables, avocados, olive oil, chickpeas, oats, eggs, seeds and nuts. According to research, if your body is deficient in folic acid, then you are more likely to develop depression. So you’d better start chomping on those greens. Foods rich in folic acid: Spinach, kale, romaine lettuce, collards or chard. Vitamin B 12 is also known as the anti-stress vitamin. When the body is not getting enough vitamin B-12, it can result in feeling lethargic and lacking motivation for day to day activities. That’s no fun, so why not up your intake of shellfish (the richest source of vitamin B-12)? Alternatively you can find it in different meats, sea food, milk and eggs. If you eat meat and seafood, check its origin and support organic and free-range options. You can read more about vitamin B12 in my previous article about the warning symptoms of vitamin B12 deficiency and how to correct it. Tryptophan is not your every day word, so I would forgive you for not knowing what the hell it is. Let me fill you in. Tryptophan is an amino acid. Fruits with a good ratio of tryptophan to phenylalanine and leucine (also amino acids), will increase serotonin levels, and thus feelings of happiness. Foods rich in Tryptophan: Dates (nature’s candy), papaya, banana and dark chocolate. Our brain loves selenium. Five studies have showed that low selenium intake is associated with poorer mood, so it’s important that we incorporate selenium into our diet in order to maintain a healthy state of mind. Foods rich in selenium: Brazil nuts, seeds, seafood, pork tenderloin, fish, whole grains, chicken, turkey, lean lamb, brown rice, oatmeal, eggs, pinto beans, and mushrooms. Further reading: Warning Symptoms of Selenium Deficiency and How to Avoid It. A diet low in zinc can contribute to feelings of depression. So come on and get happy by upping your intake of zinc-rich foods to help balance your mood. Foods rich in zinc: Cashew nuts, seafood, pumpkin seeds, pork loin and dark chocolate. Further reading: Warning Signs of Zinc Deficiency and How to Cure It. Whole grains found in complex carbs are full of heart healthy nutrients (high in fiber, vitamins and amino acids). The good news doesn’t just stop there either. Whole grains are a great way to boost your mood and help fight depression. Complex carbohydrate foods with whole grains: Brown rice, whole wheat pasta, whole grain bread and whole grain cereal. Further reading: The Functions of Carbohydrates and Why They’re Vital To Your Health. Protein-rich foods are popular with athletes as they help to repair and build muscle, but another reason protein is great for active individuals is that it is rich in an amino acid called tyrosine. Tyrosine has been proven to help increase levels of dopamine and norepinephrine – brain chemicals that help you feel alert and energetic. You don’t have to be an athlete to reap the benefits of protein. By incorporating it into your daily diet, you will feel that boost of energy which can contribute to a better mood. Foods rich in Protein: Poultry, beans, nuts and seeds, eggs, fish, lean beef and dairy produce. A lot of the foods listed under the other categories in this article, contain antioxidants too. Antioxidants are fabulous as they eliminate damaging molecules (free radicals) from our bodies. Free radicals can affect the brain, but consuming plenty of foods rich in antioxidants is the best way to reduces the chances of free radicals running riot in your body. Foods rich in antioxidants:Nuts, seeds, green tea, spinach, kale, broccoli, berries, kiwifruits, tomatoes, dark chocolate, oranges and peppers. Further reading: 9 amazing antioxidants for great health and how to incorporate them in your diet. You can get more information about berries in my e-book The Healing Berry Guide where you can find more information about the healing powers of berries and and how they can help you to become healthier from the inside out. According to WebMD, a 2010 national study showed a person is more likely to suffer from depression if their body is deficient in vitamin D. So make sure you step outside and enjoy the sunshine. The sun is regarded as a natural source of vitamin D. Just ten to fifteen minutes of sun exposure every day provides the human body with 100% of it’s daily intake of vitamin D. Those with darker skin may need five to ten minutes longer. However, if you live in a colder climate where there is not much sun, then you can boost your intake of vitamin D through your diet and supplements. Food and supplements rich in Vitamin D: A very small amount comes from a few foods you eat, such as some fish, fish liver oils, egg yolks and in fortified dairy, cereals and grain products. You may need to take vitamin D supplement if you don’t get enough of it after consulting with your doctor. Drinking plenty of water (around two liters a day for the average adult) is essential to keep the body in optimum condition. Dehydration is associated with low mood and so increasing your water intake is bound to put a spring in your step. In addition water can also help you flush fat or you can easily make your own flavored water. Caffeine – Drinking lots of coffee and tea can increase levels of anxiety and then sends you on a come down, which can make you feel depressed. Sugar – Excess sugar consumption causes inflammation in the gut, body and brain, which causes an inflammation-immune chain reaction response which can result in depression and anxiety. Alcohol – Alcohol affects the chemicals in your brain. Drinking too much alcohol over a long period of time can affect the brain and cause feelings of anxiousness and anger. In order to maintain a good mood, it is important to eat little and often. This keeps your energy levels up which enables you to achieve what you want with your day. Also, between meals, have a snack if you want to – just make it a healthy one. Nuts such as almonds or walnuts are a great choice as they are naturally low in sugar and release their energy slowly, keeping you satisfied for longer. Start the day right with a nutritious breakfast to set you off on the right track for the day ahead. Try downing a glass of warm water with lemon, then a bowl of oatmeal made with water or milk, topped with sliced banana and chopped nuts with a drizzle of raw honey. Wash that down with a homemade green juice or smoothie and you will be good to go! Further reading: Healthy Breakfast Recipes in 5 Minutes + Easy Smoothie Recipes. Here’s to happy days without the lows!